Mikron Multifast -- fast changeovers. 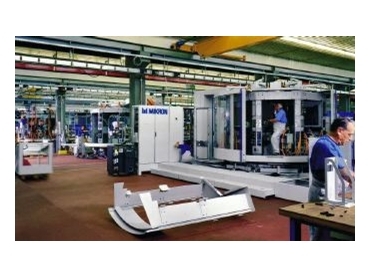 THE Multifast machining system from Mikron SA Agno, represented by Bliss & Reels , is a modular, rotary table machine. It grows with the user's production requirements, is scaleable and its equipment can easily be changed. It therefore adapts itself, problem-free, to changing machining operations and lot sizes, and is configured quickly, customer tailored, and supplied ready to use. Highest productivity is reached with the application of two spindles per station and CNC technology. The control, based on HMI (Human Machine Interface), allows workshop oriented programming (WOP). Particularly the manufacturers who are specialised in high demanding precision parts are interested more and more in the Multifast. The automatic complete machining, taking into account the workpiece costs, the qualitative demand and compulsory delivery commitments, can be managed with the greatest flexibility.